Whenever I have a plethora of strawberries around the house, I love to use them up to make these delicious rolls. My secret ingredient is rhubarb, which makes them more on the tart side. You can serve these cinnamon rolls for breakfast or dessert with glaze, and they keep very well in the freezer. The dough is more of a pastry texture rather than a bread since the rising time is short. Add the milk and yeast to a mixing bowl and let sit for 5 minutes. Whisk in the flour, salt, cinnamon, sugar, egg and butter and knead with hands to form a dough. Set the dough aside to rise for 30 minutes. Roll dough out onto a floured surface in the shape of a large rectangle. Add half of the strawberries, rhubarb and all of the water to a Magic Bullet pitcher and blend, then add to a pot with the remaining fruit, cinnamon and lemon juice. Simmer for 5 minutes, then cool to room temperature. Spread the filling over the dough, roll up and slice into 8 rolls. Place the rolls onto a baking sheet and bake at 350 degrees F for 25-30 minutes. Looking for a super easy and delicious dessert? You will not believe how easy this blender chocolate mousse is to make and how it tastes like it took way longer to prepare. The only tricky part is the cream needs to be warmed before using it to melt the chocolate, but you don’t want it to be too hot when adding it to the blender. Once it is ready to add in, everything blends together nicely in the Magic Bullet creating a light, fluffy mousse once cooled. Top with fresh fruit or whipped cream. Heat the cream in a small pot until almost boiling, then remove from heat and let sit 3 minutes. Pour over chocolate chips and add the vanilla, butter, egg, and salt. Allow to cool to room temperature, then blend. Pour into 2 4-inch ramekins and chill for 2 hours. One of my go-to salad dressing recipes is this herbed vinaigrette recipe. It is simple, but something everyone likes. It also goes with many different salads, so get inspired and feel free to experiment! The best part of this recipe is that you probably already have all of the necessary ingredients at home. Add all ingredients to a small Magic Bullet cup and blend. This lemon basil fish marinade recipe is a product of me having too much basil. Whenever I buy a basil plant, it seems to grow like crazy and I can never keep up with the amount of basil it produces. It turns out, basil is a super flavorful addition to marinades, like this fish marinade. I haven’t tried it with any other fish other than tilapia, so I don’t know how well it goes with other types of fish. Let us know if you try it! Add all ingredients to a small Magic Bullet cup and blend together. Pour over fish and marinade. This easy strawberry purée is a simple addition to your breakfast table or dessert spread that will add a fresh, healthy twist. Your guests at the table will appreciate your homemade effort. You can use this strawberry purée on an endless number of things, such as cheesecake, waffles, ice cream, or yogurt. Add more or less sugar to meet your personal preference. In a small saucepot, add the strawberries and cook over low heat for 10 minutes, stirring occasionally. Stir in the sugar and let cool. Pour the vanilla on top. 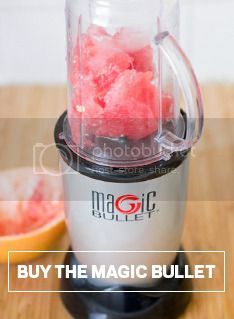 Transfer to a Magic Bullet cup and blend. This nutty, spiced sweet potato bread pairs nicely with a warm cup of tea or coffee and whipped honey butter. It is best warm right from the oven after cooling about 15 minutes. You can place extra loaves in a freezer, wrapped in foil and placed into freezer bags and they will keep for a few months. When ready to consume, thaw overnight or bake in the oven for 15 minutes at 350 F. This recipe makes one large loaf, or 4 mini loaves. Add the cooled sweet potato, eggs, oil and water to a Magic Bullet pitcher and blend. Add the flour, baking soda, cinnamon, nutmeg and salt to a large mixing bowl. Pour the sweet potato mixture over the dry ingredients and stir. Pour into a greased 9×4 inch loaf pan and bake for 1 hour.